← Have a good night, Mare. Forgive me reader for I have sworn. It’s been 602,487 eff-words since my last confession. That’s a lie, it’s been more. I’m not even at the forefront of this epidemic; I’m just riding the effing wave. You know it’s true. The word is everywhere, inescapable. Eff is the Snookie of swear words. Inexplicably everywhere. The movie Ted won its opening weekend with $54 million. I haven’t seen it, but I hear that’s about a buck an eff. Not everyone says it, but everybody knows it. I dare you to try and go a whole day without coming into contact with it. Twenty-four hours. Beginning after this blog, of course. Because even though I don’t say it, I’m totally saying it. Ban it from your vocabulary, gate it from your thoughts, but unless you cordon yourself off socially, you will have a tough time not crossing its path. Eff is great multi-purpose word. It’s a noun, verb, adjective, and what the heck, Effly! Now it’s an adverb, too. It adds flavor, excitement, disappointment, anger, humor—EMOTION. A well-placed eff can make all the difference. Word du jour? More like mot de chaque moment de réveil. Word of every waking moment. I am familiar with other swear words. 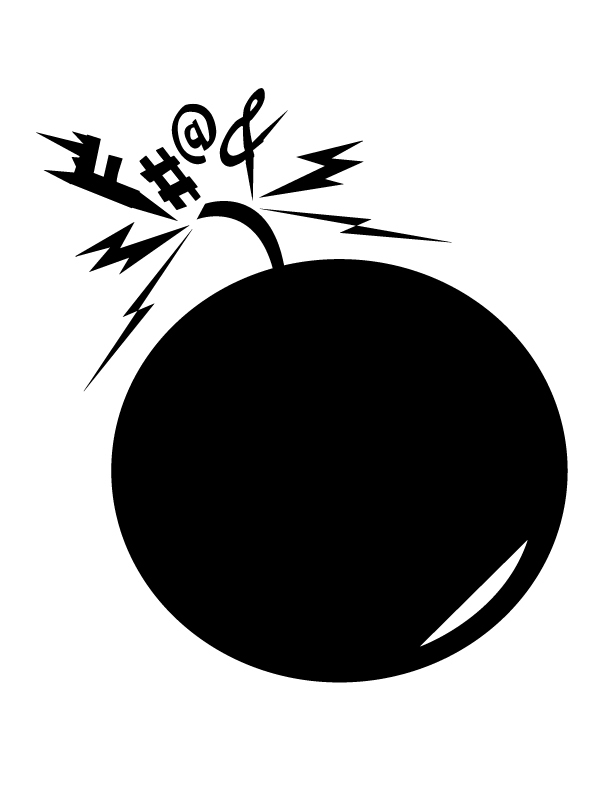 I have wielded, “Atomic,” and spewed, “Hydrogen,” but there is a certain pleasure derived from a well-placed Eff-bomb. I can’t explain it, but I probably don’t have to. You know. Come to the eff-side. Join the sailors, truckers, comedians, cool kids, uneducated and soccer moms. Maybe that’s the only way to disarm the word. If every grandma is saying it, it will lose its appeal. I doubt it. It’s effing hilarious when Betty White drops one. This entry was posted in Uncategorized and tagged eff bomb, eff word, swear words. Bookmark the permalink. Your blog is so effing right. Have you seen Dane Cook’s monologue where he talks about how perfect that word is? It’s hilarious.